SO WHO IS WHIMSICAL ARTICLES? 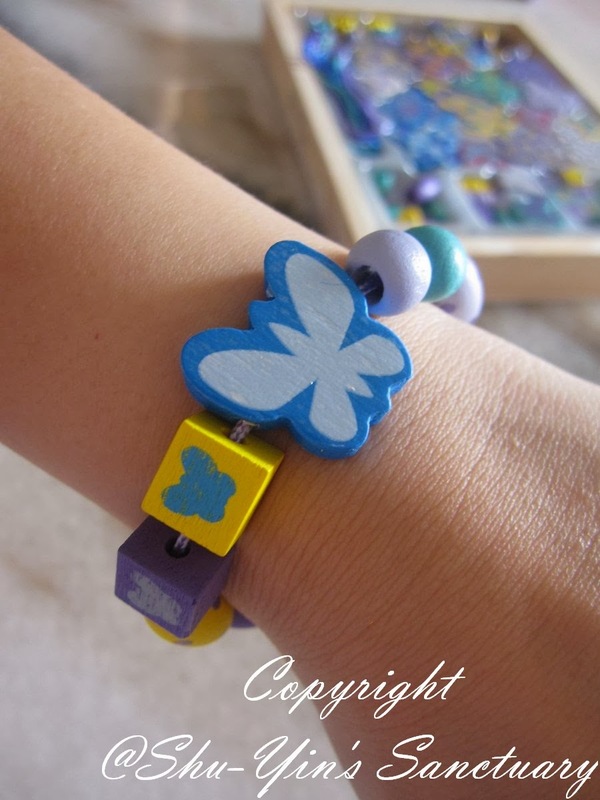 Whimsical Articles is a relatively new online store which sells creative and fun things for kids. They have a scrapbook range for kids and also a range of creative and educational activities. 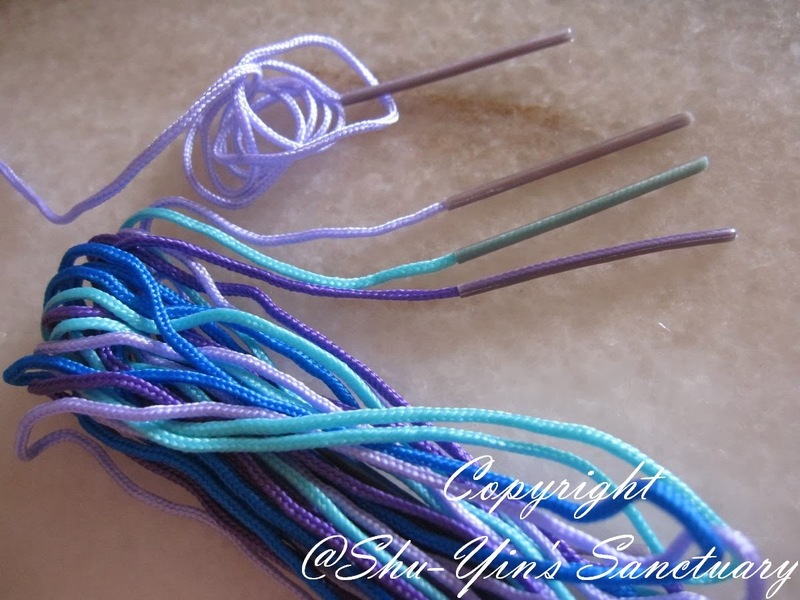 I was really glad to be given an opportunity by Karen Loh from WA to let Shern try out a few things from their shop. 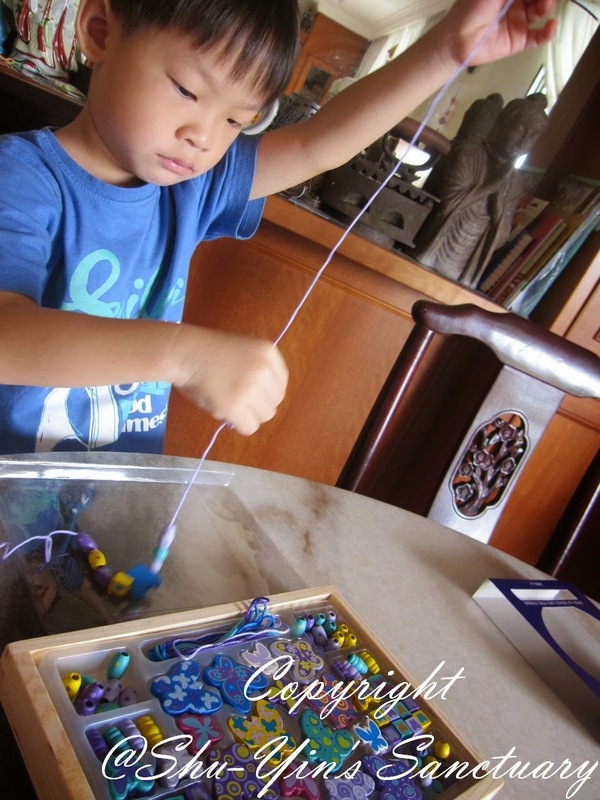 It was the school holidays then and my son could use with some arts and craft session, so timing was just perfect! 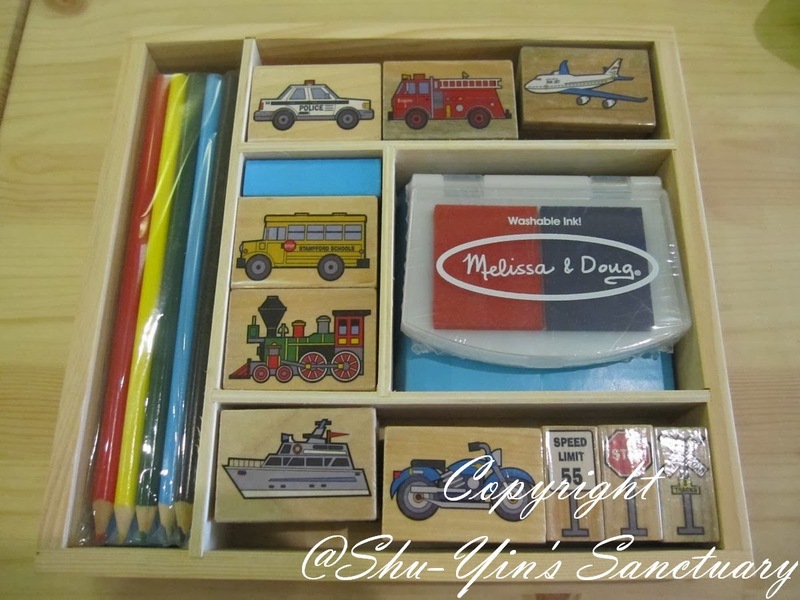 I chose Melissa and Doug's Wooden Vehicle Stamp Set, and also the Butterfly Friends Wooden Bead Set which I thought would appeal to Shern, and also will benefit him. It came in a sturdy brown box, similar to a pizza box, with a simple print of the company's brand at the bottom right corner of the box. I like the simplicity of the packaging. I also like the sturdy box. 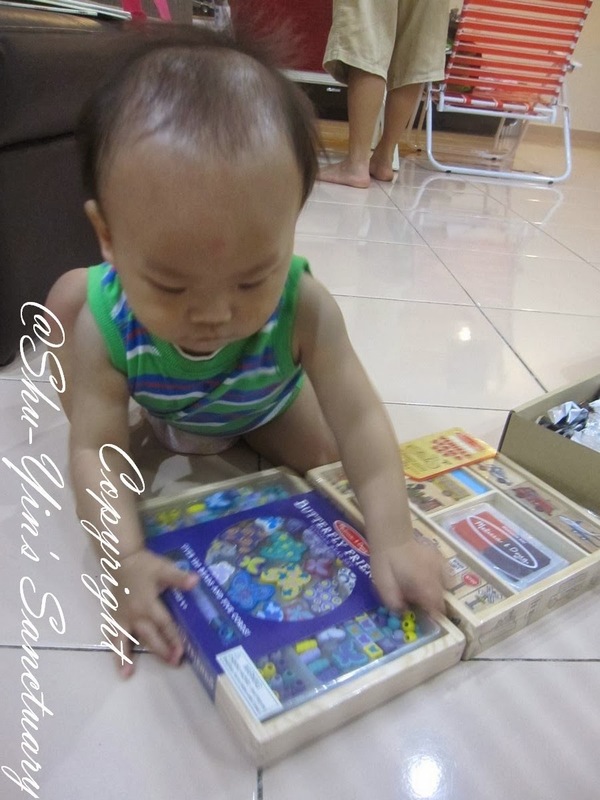 When opened up, the 2 wooden sets I chose were inside, cushioned with some recycled, crumpled magazine papers. The wooden sets were also individually wrapped up with a bubble wrap. Thumbs up for the packaging, as the items arrived in tip top condition with the added cushion of the magazine papers and bubble wraps, coupled with the sturdy pizza box. 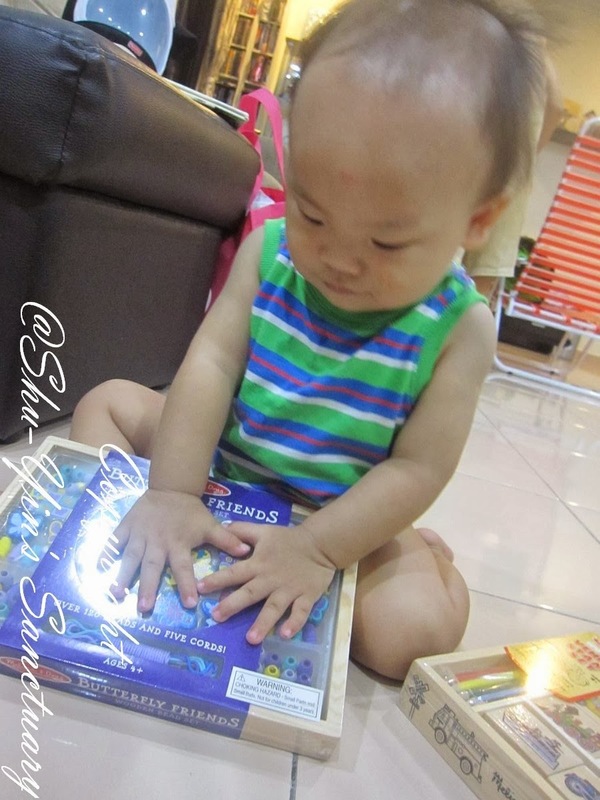 Khye was curious and he just couldn't wait to get his hands on them. Surprisingly, although they are wooden box sets, the boxes were not heavy, and so Khye could lift them up all by himself. And since they were not too heavy, I was not afraid that he would drop them on his toes or something. But then I didn't open up the wrappings because these toys are not meant for Khye. He is too little to handle them. So when Shern and I had some free time, I decided to bring it out for Shern to try them out. Let's see how each one fares. This wooden bead set came in a wooden box and shrink-wrapped. 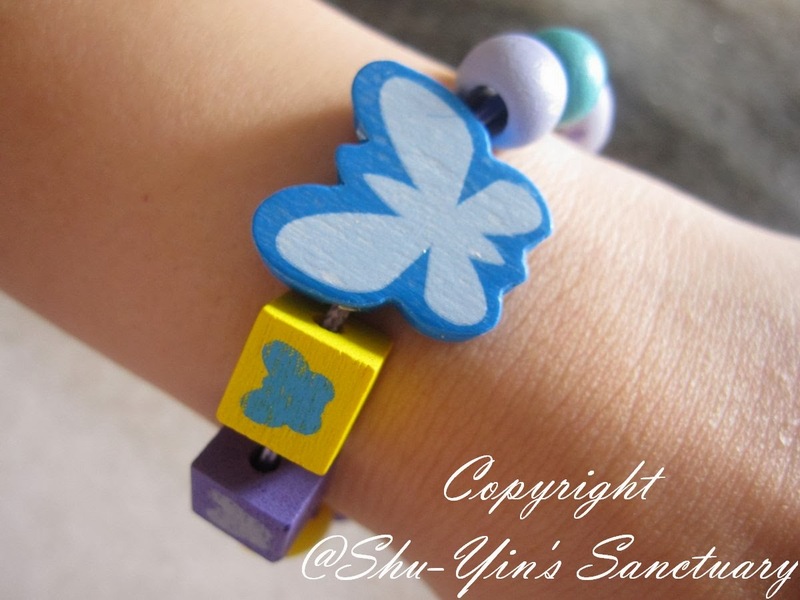 It is meant for kids 4+ yrs old to design jewelry with a butterfly-theme. It also came in a flimsy plastic organizer which features over 120 beads and five cords, and also a flimsy plastic cover. 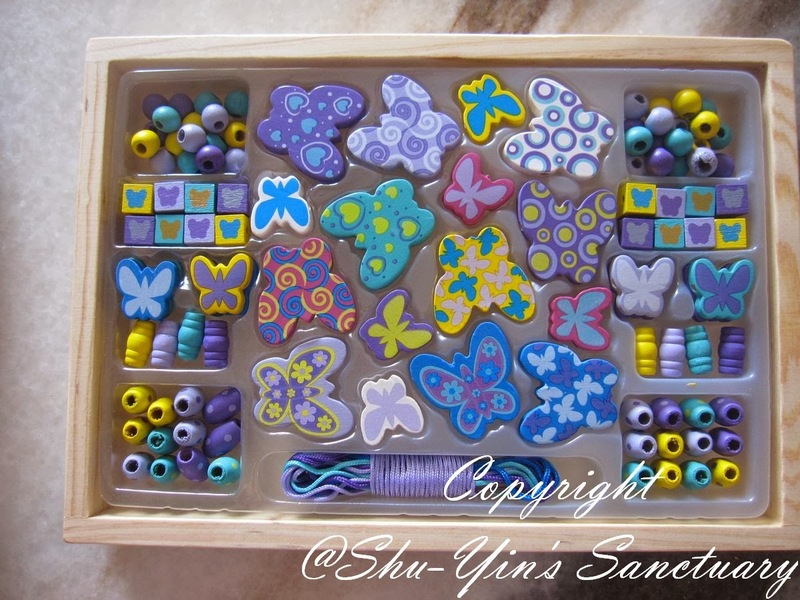 The flimsy plastic organizer is not very suitable for Shern as it was difficult to arrange everything nicely back in once they were all taken out. 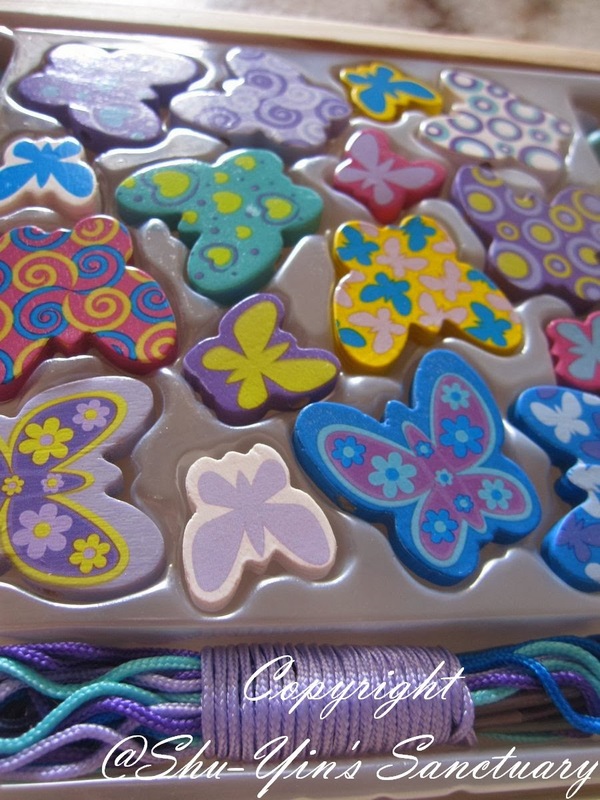 It features a variety of pretty colourful butterflies, and of different sizes. 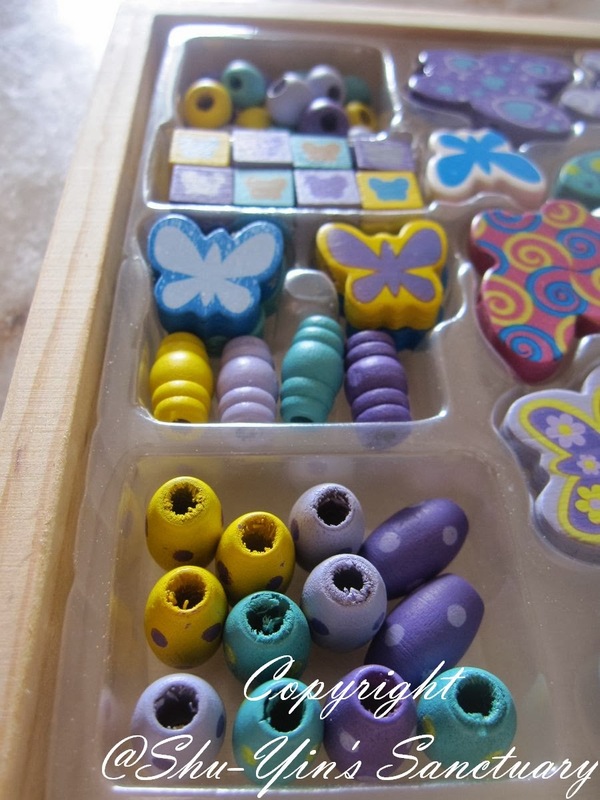 There were also many smaller accent beads in different shapes; squares, circles and tubed shapes. 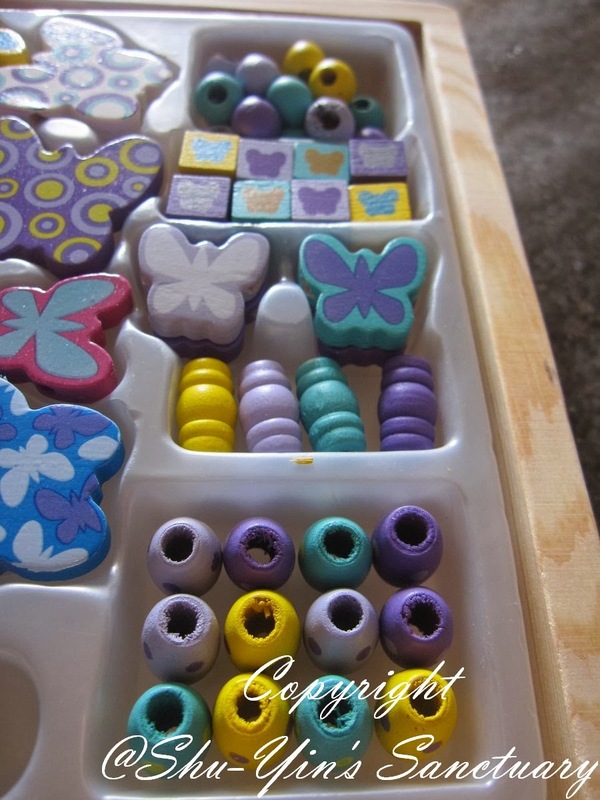 The wooden beads were hand crafted, thus some of the holes ends are uneven. But there are no sharp edges to them, so is ok. 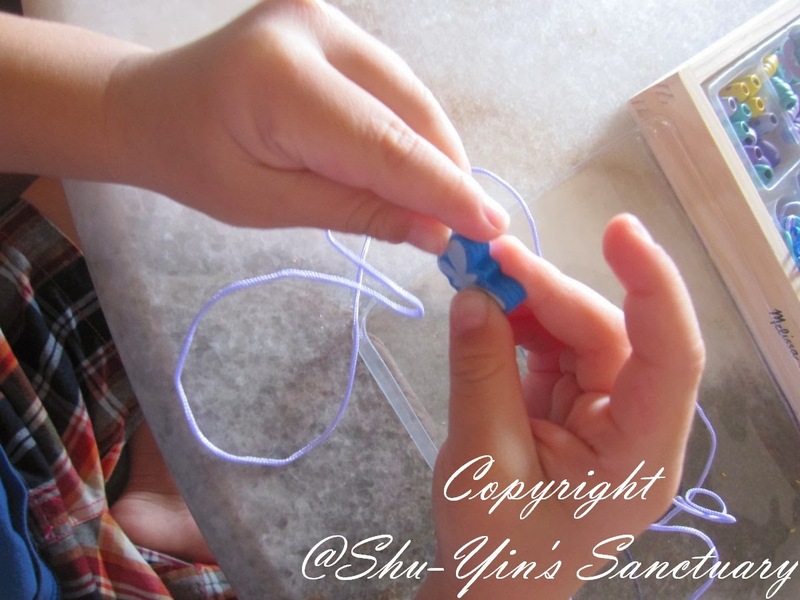 There were 5 cords in the box set (Shern was stringing one of them), and I like that the ends of the cords were wrapped with a kind of hard plastic, so it was pretty easy for kids to hold on to and string! Brilliant! 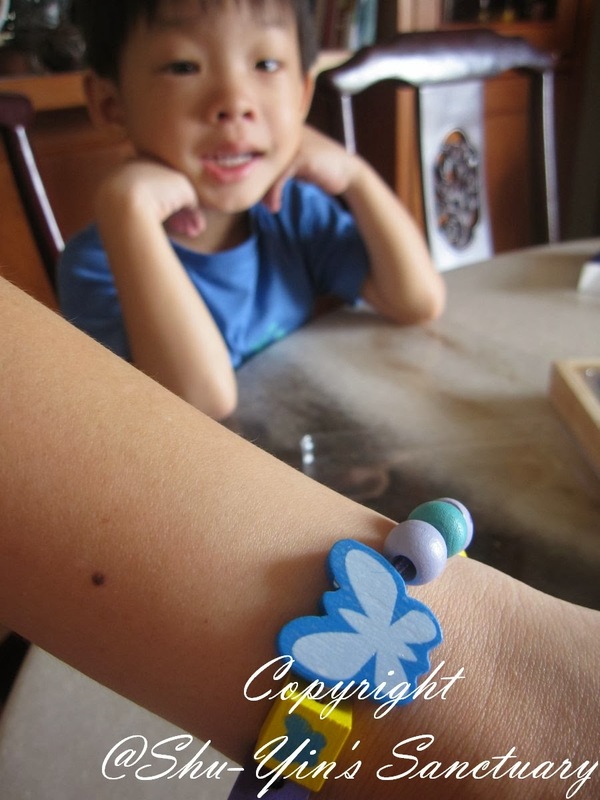 Shern was pretty excited when he saw the pretty beads and butterflies. He likes butterflies and often drew them in his drawings. So he was excited and immediately said he wanted to make a bracelet for me, and a necklace for yee-yee. I gave him the freedom to choose his own design. 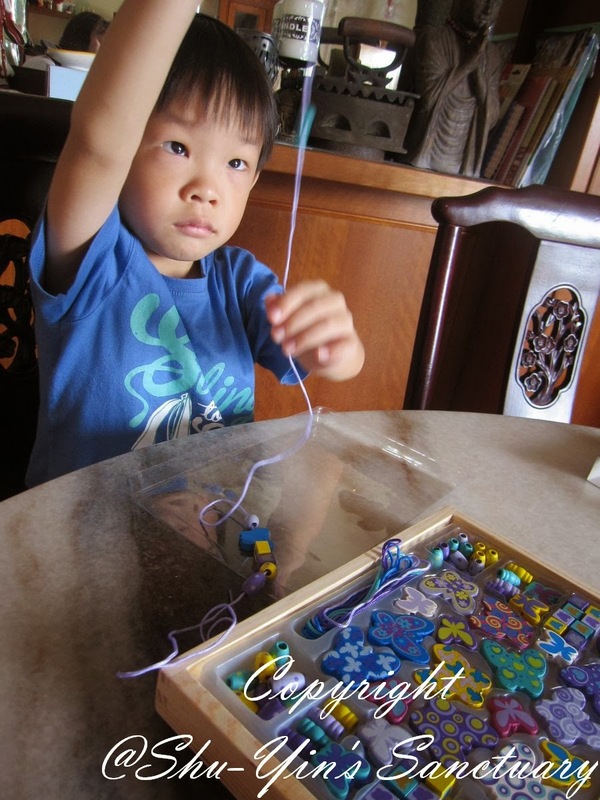 He paused for awhile and chose a few beads he wanted to work with. 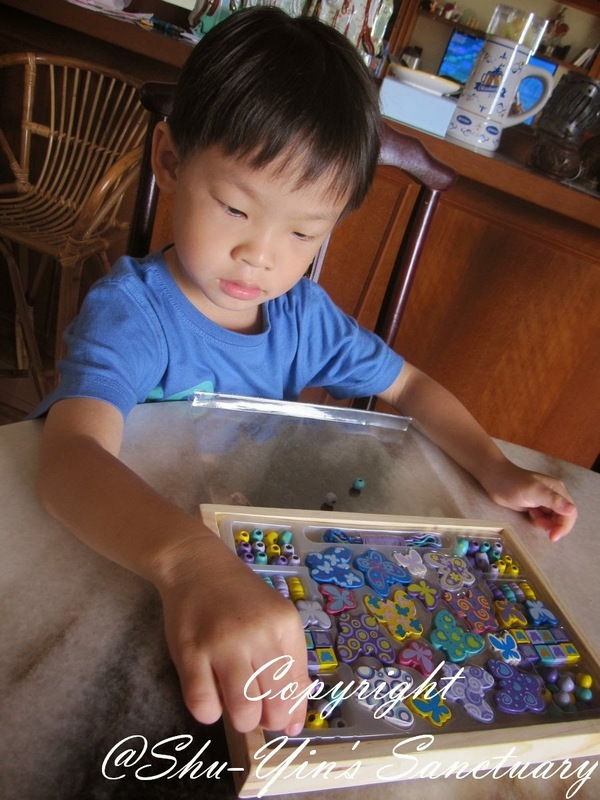 I overturned the plastic cover for him to put his chosen beads so that they don't roll and dropped onto the floor, as it may cause a choking hazard for Khye. 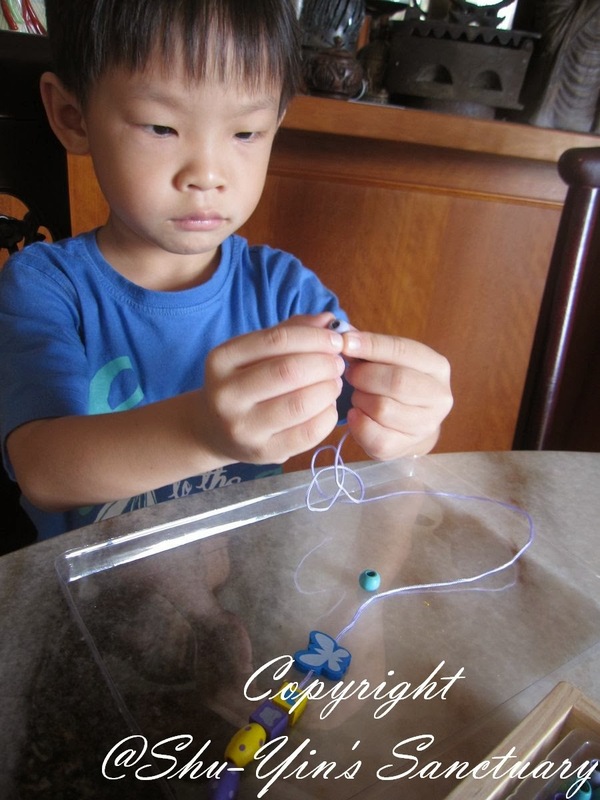 I like that it was pretty simple, and I didn't really need to teach him and he immediately knew how to string the beads to the cord. 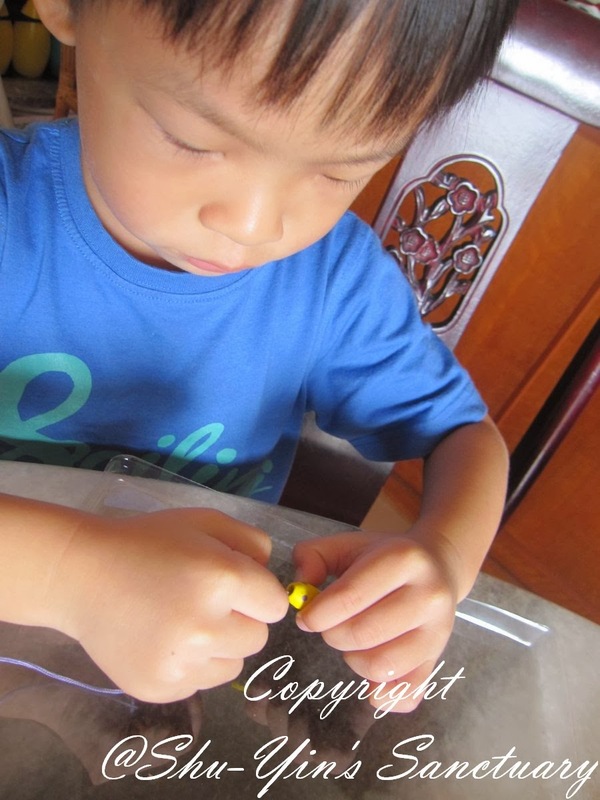 The reason I chose this activity box for Shern was because he actually has quite poor fine motor skills, so I was hoping this activity would enhance his fine motor skills while having some fun. 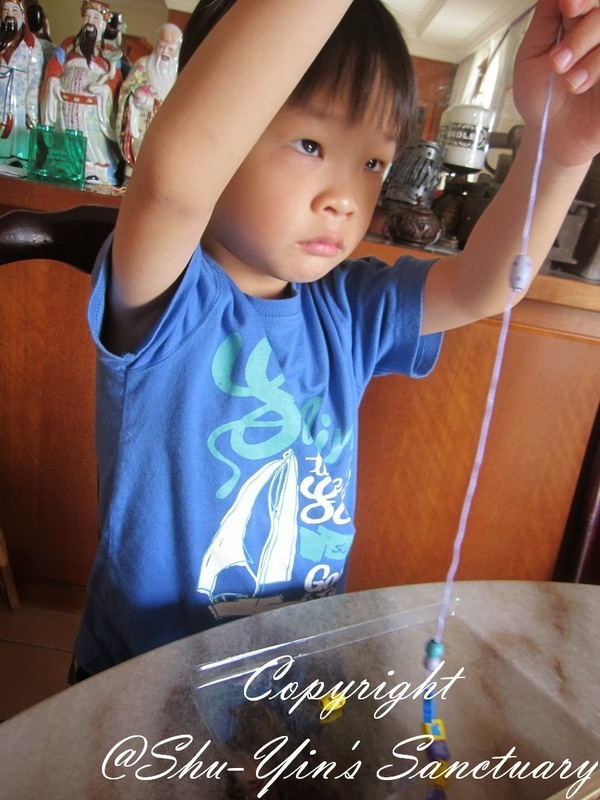 Look at Shern frowing while stringing the beads. He was so serious. It took him about 10 minutes to finish choosing his design and stringing them, and when he showed me the final product I was pretty impressed. I tied the string to make it shorter and then wore it on my hand as a bracelet. I hadn't the heart to cut it short, so I just make a big knot behind it so that it can be reused again and again. 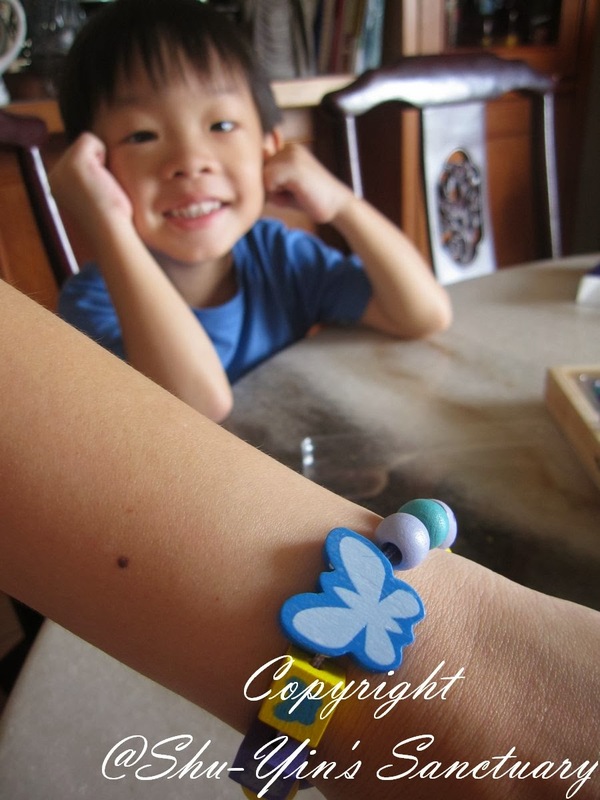 Shern was pretty pleased with his jewellery making and asked me to wear the bracelet for the whole day! And I did, as I am also a proud mum of my son's work! What needed to be improved is that the butterfly accent prints is only on one side. 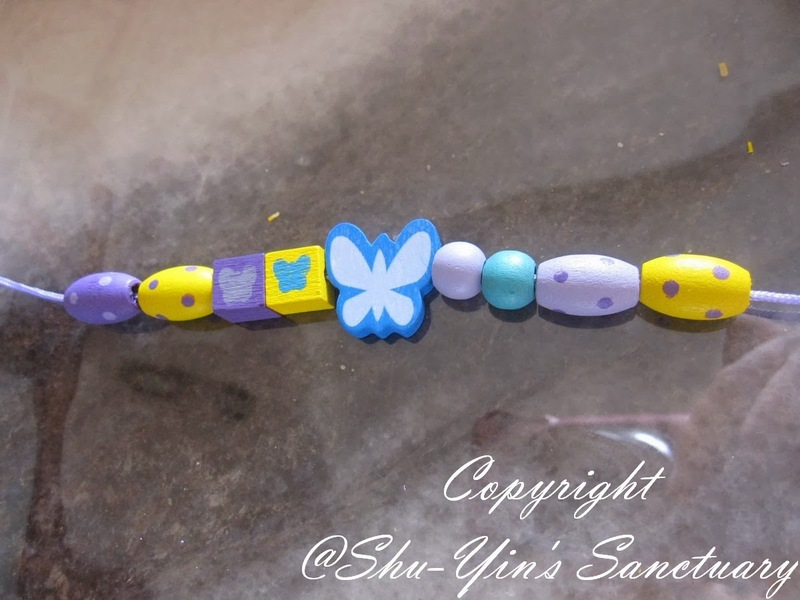 So when we tried making a long necklace, the butterfly seem to always spin backwards when I wore the necklace on my neck. I wish the prints are on two-sides so that no matter how they spin, they will always stay pretty. And I wish that the box set comes with more cords. 5 cords is definitely not enough as there were so many beads! Another complain is that there is no box cover for this if I remove the flimsy plastic organizer. I wish there is an additional cover which covers the whole thing so that they won't get lost. In the end, I ended up putting the whole thing into my own container, ensuring that the small beads won't get lost and cause a choking hazard to Khye! But all in all, it was a fun activity. We had some rainy days during the beginning of the school holidays and so it was the perfect activity for indoor. 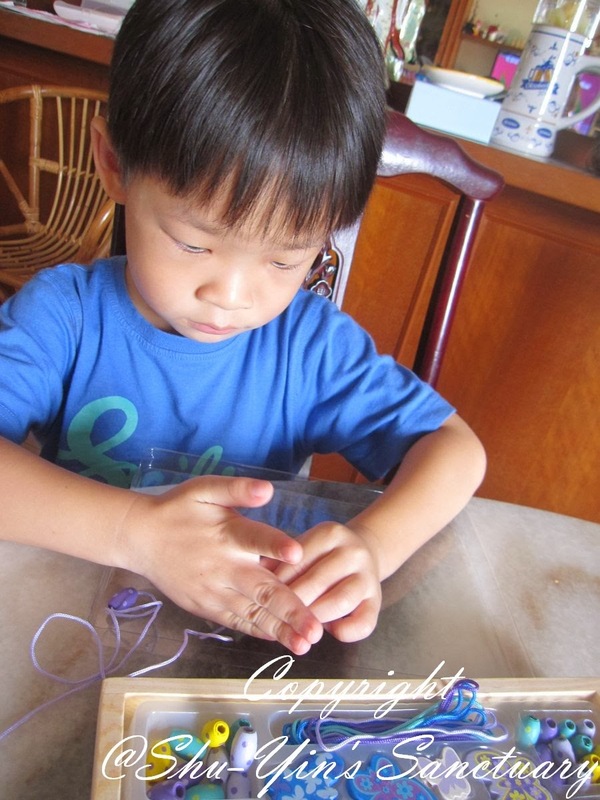 This activity is simple and yet engaging. 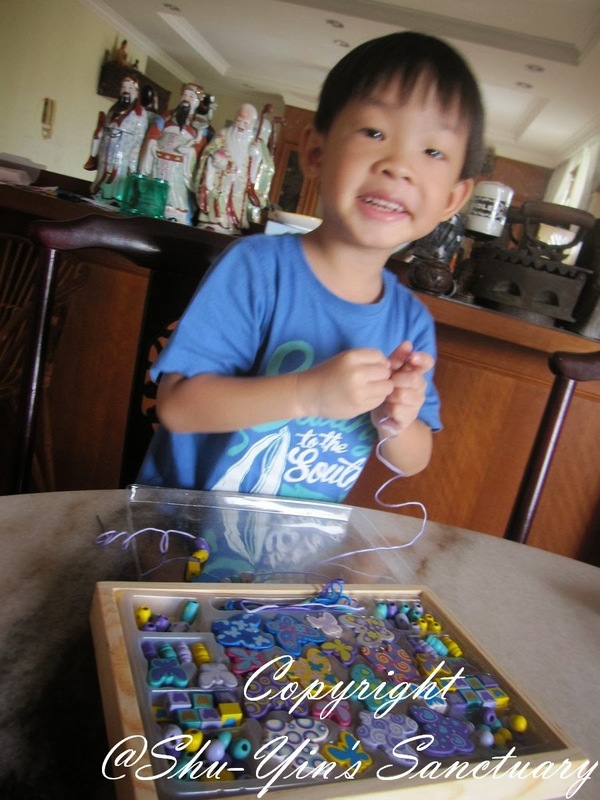 And also I feel that I somehow improved Shern's fine motor skills with him trying to bead and string. The more he did, the faster he did it. He was quite good at it after a few times that he could finish a jewelry piece in less than 5 mins! Definitely a recommended fun activity for kids above 4+! 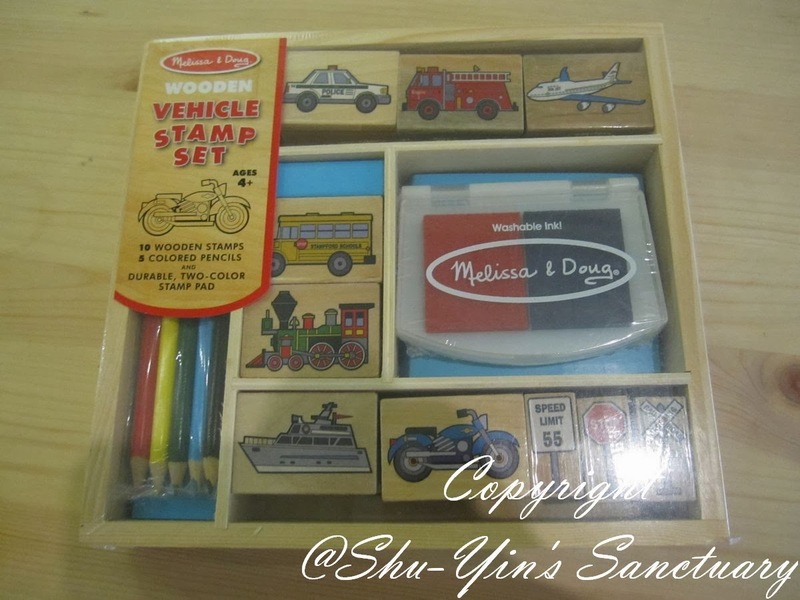 I chose this vehicle stamp set because Shern loves vehicles, especially trains. And I spotted a train stamp inside the set. And remember his obsession with traffic signs? And furthermore, I haven't introduced stamping to Shern before so I was hoping he would be intrigue with stamping. 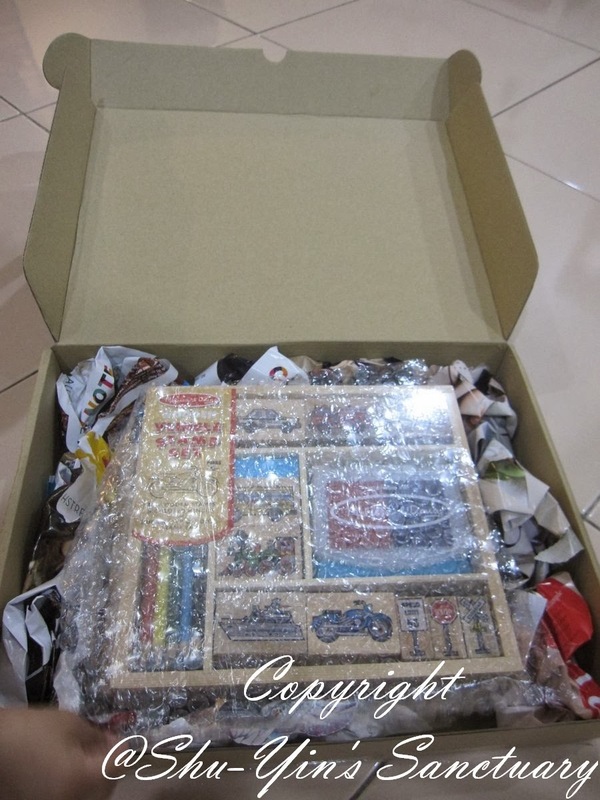 And just like the beads set, this wooden vehicle stamp set came in a wooden box and shrink-wrapped. It is also recommended for kids 4+ yrs old. Once I removed the shink wrap, this was what we got. 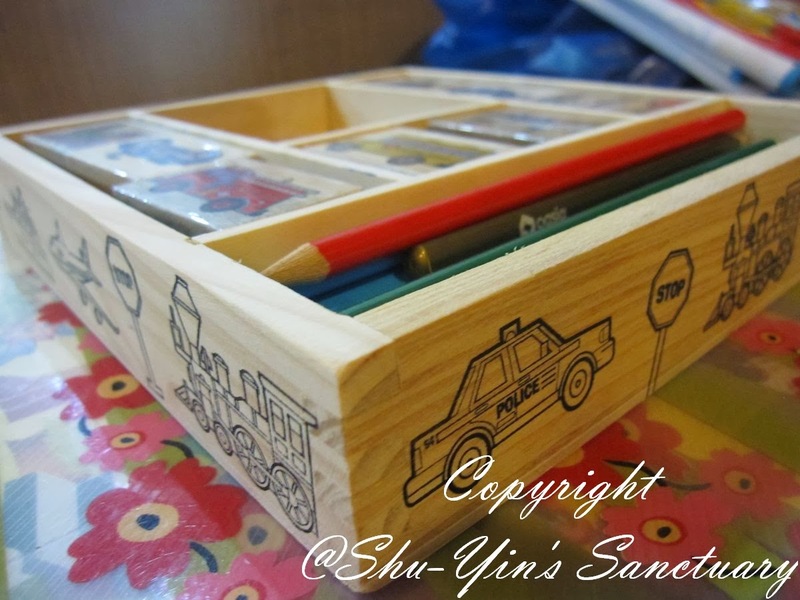 7 vehicles wooden rubber stamps, 3 traffic signs wooden rubber stamp, a 2-colour inkpad, and 5 coloured pencils. The moment I took it out, Shern couldn't wait to start stamping the train! Haha. I knew he would love that one. He was busy stamping away. He spent more than half an hour concentrating and stamping what he desires the first time. Good activity to keep him occupied while I finish some work. 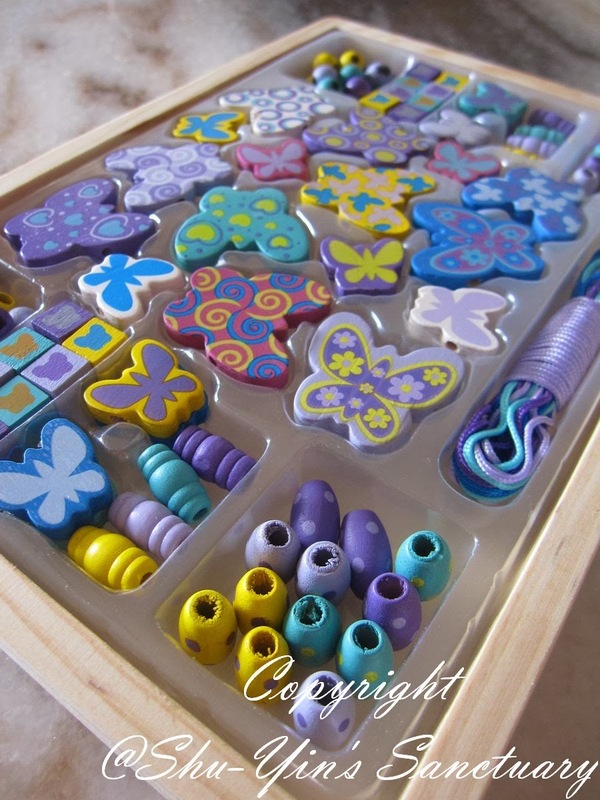 And then the next time I took it out again, I introduced a new way of using this stamp set. I asked him to draw a scene, and then he could stamp the vehicles into the scene. So Shern drew a scene all by himself, with a little guidance from me. And then he stamped the vehicles and road signs on where he deemed fit. 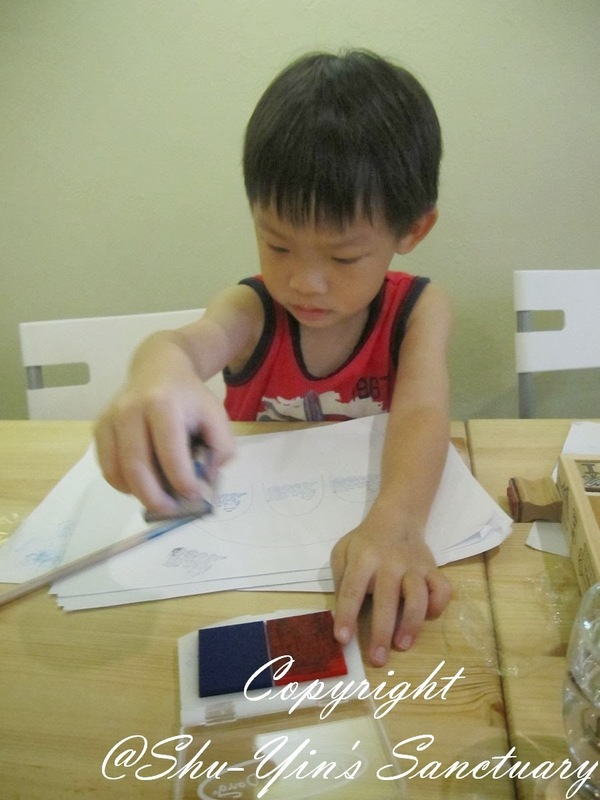 After drawing it with a pencil, he also used the 5 coloured pencils given in the box to colour his drawing. He was pretty proud of his work. Let me show you what he did with it. On the drawing at the very top, he drew some mountains some birds and a sun to indicates the sky. That was where he stamped the airplane. And then he drew a railway and he stamped the train and 2 railway crossing signs. 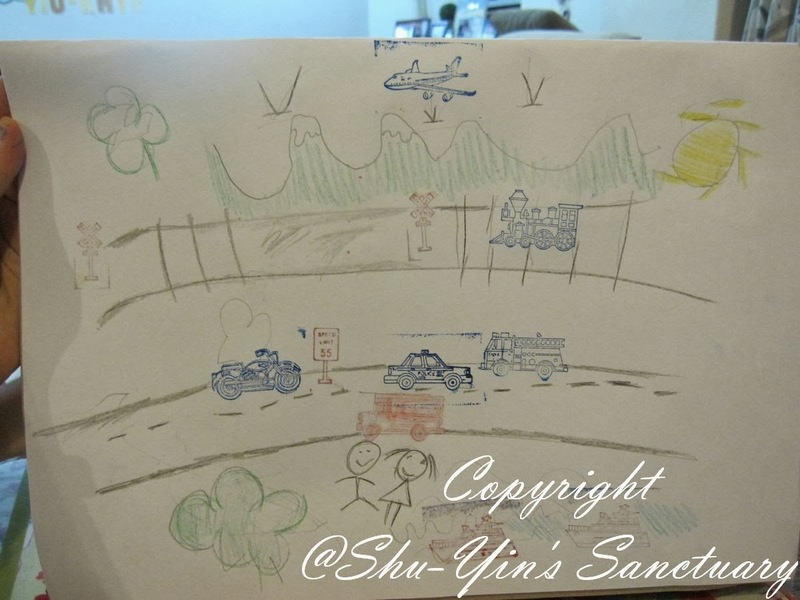 Then further down he drew a road and he stamped the motor cycle, a police car and a fire engine truck sharing the same road, with the speed limit sign. 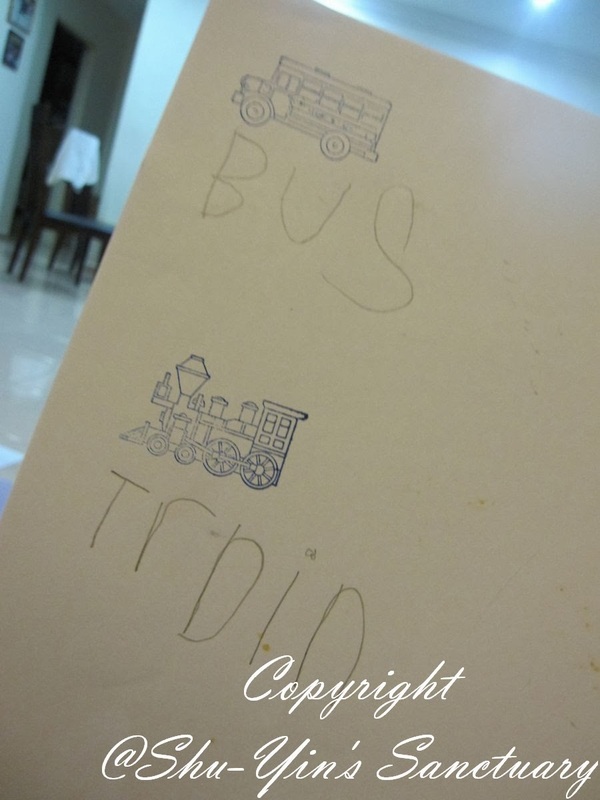 And he also stamped a school bus on it and beneath it he drew 2 kids, a boy and a girl. And lastly at the bottom of the drawing, he drew some waves which indicates the ocean and he stamped 2 ships there. Based on the drawing, I could make some analysis on the material. First of all, the red colour ink is really light, and so all you could see was the blue colour. Somehow the red colour is not vivid enough. And then because it was a 2-colour inkpad, sometimes when Shern stamped on both colours at once, and thus making the red inkpad smeared with blue which is a more dominant colour. This causes a 'dirty' colour when he stamps on the paper. Would prefer 2 separate inkpads of different colours. But I love the very detailed print that the stamps provided. You could see every line and detail of the vehicles. It's really amazing and Shern loves it. As for the 5 colour pencils provided, it is of more inferior quality. It is very difficult to colour them as the colour is very light. You need to really use your strength and press hard when using it. It is as if there is a layer of wax at the tip of the pencils lead that make the colours can't come out. We also found other ways of using the stamp set. For instance, I took the chance to teach Shern some spelling with it. Shern would stamp a vehicle on the paper, and then he would write out the spellings of the vehicles. 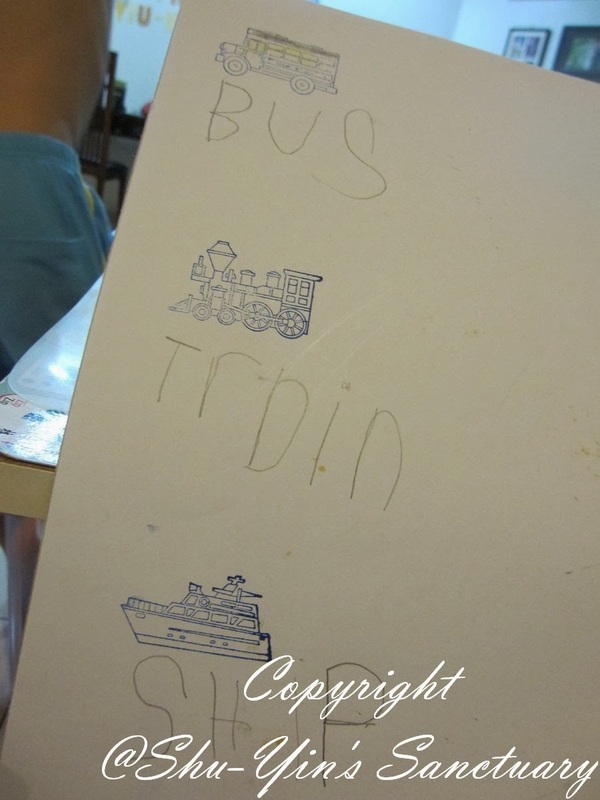 So far, he could spell BUS and SHIP, and of course his favourite TRAIN. 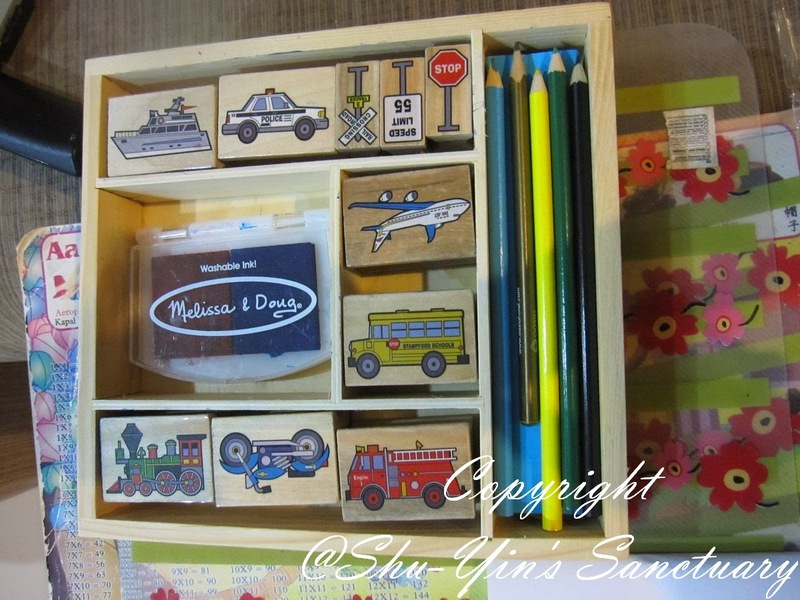 Overall, it is a really good stamp box set, apart from the inferior colour pencils. We had so many hours of fun with it. Shern was always begging me to take it out for him. Initially I only let him use under my supervision as I was afraid he would smear all the inks on my sofa or something. And then I realized that the inks are washable, how about that! So now I let down my guard and let him use even when I'm not so closeby. Haha. And I also have a peace of mind because they are non-toxic and kid-friendly ink! But I also wish they have a wooden cover for it. 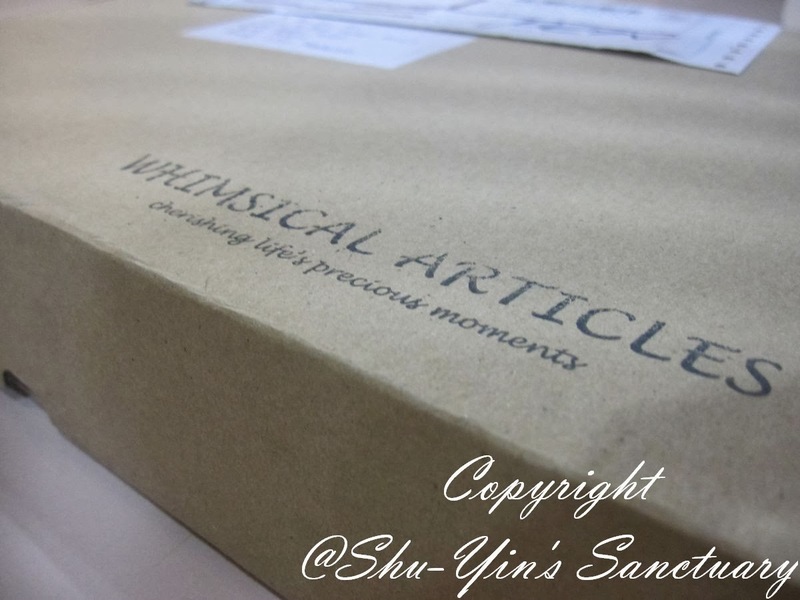 There aren't any box covers, so it is difficult to keep the stamps and all back into the original wooden box. 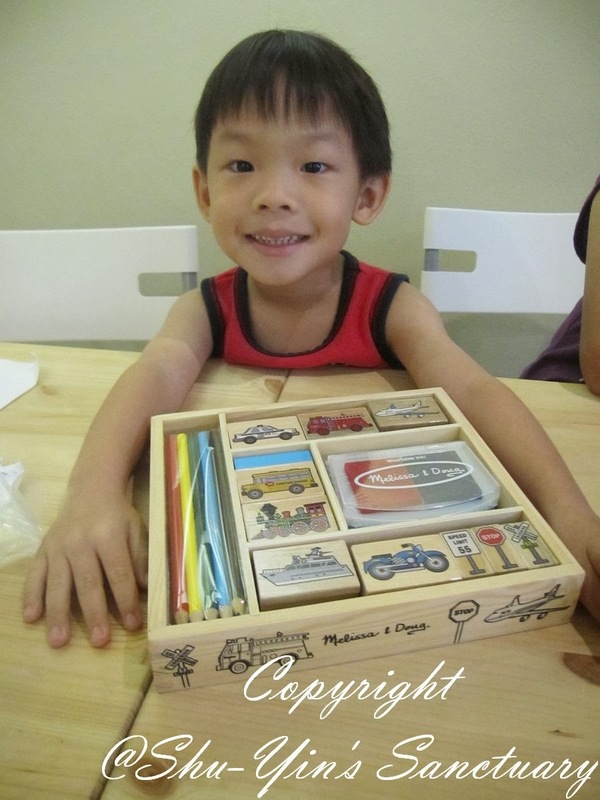 But overall, I think this is a great educational box set for kids, and also it enhances his creativity with it. 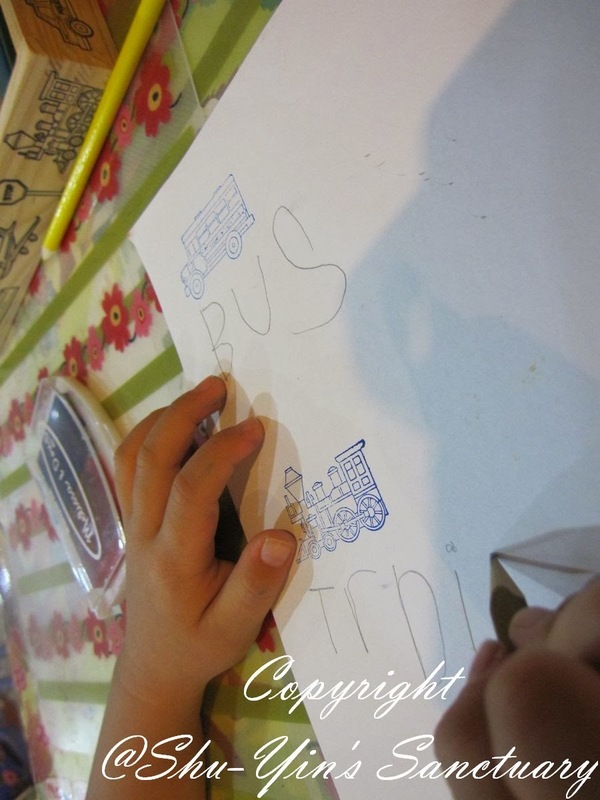 We created many visual adventures with the different vehicle stamps! There are so many uses for this that Shern and I can't get enough of it. You can purchase the these Melissa and Dog's wooden sets like mine, or even others online at Whimsical Articles online store. Or you can also check out their other great kids craft products available. They have many interesting products! Thanks to Whimsical Articles, there is a discount code for my readers. Purchase RM150.00 or more and get RM20.00 off on the total. 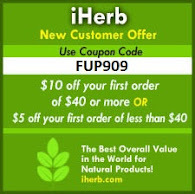 Customer can use this voucher as many time as possible. Valid from now until 31st January 2014. 2) Add in the products to purchase into cart. 4) Please check that products total is more than RM150.00 before code can be used. Also, Free Shipping applies on purchases of RM180 or more. For more info, please visit Whimsical Articles' website or their Facebook page. 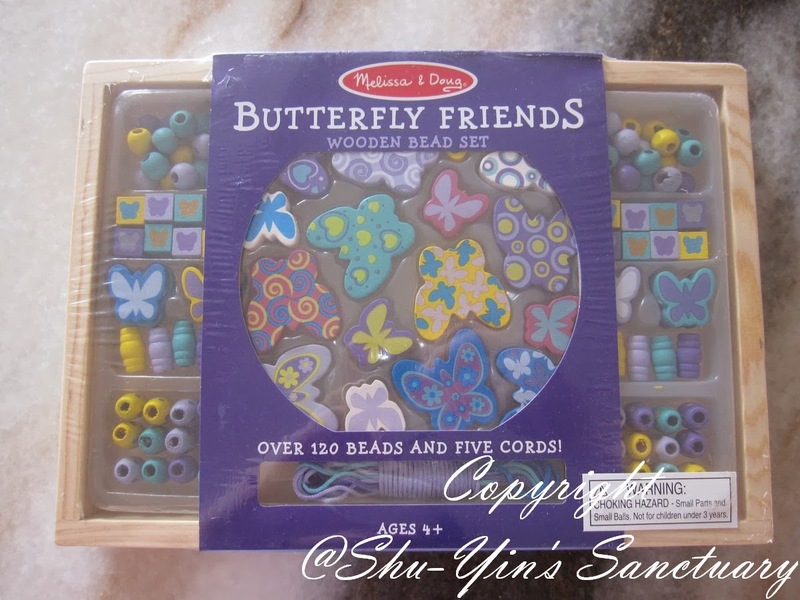 * Disclosure: I received a Melissa and Doug's Wooden Vehicle Stamp Set, and also the Butterfly Friends Wooden Bead Set for review purpose, but no monetary incentive was received. All text and opinions are of my own and represents my honest opinion of the product(s).